Report: Russia Used 'Mouse Hole' To Swap Urine Samples Of Olympic Athletes : The Torch At the 2014 Winter Games in Sochi, the Russians traded dirty urine samples for clean ones by passing them through a hole drilled into the wall of the anti-doping lab, according to an official report. 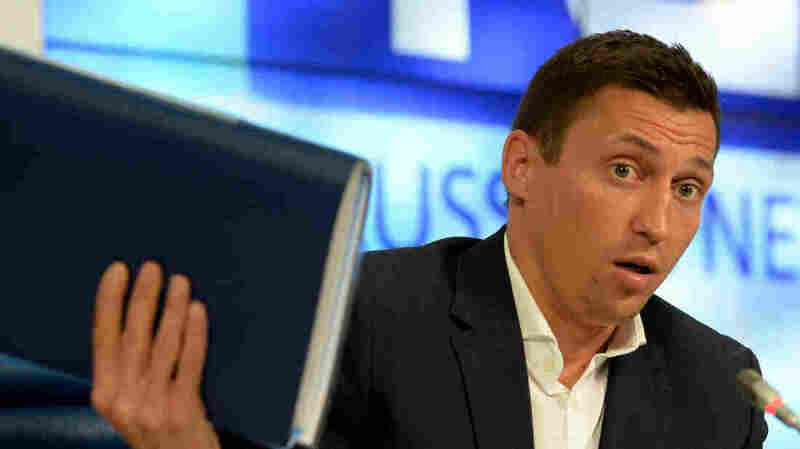 Russian cross-country skier Alexander Legkov, who won a gold and a silver at the 2014 Winter Olympics in Sochi, speaks at a news conference in May to deny allegations that dozens of Russian athletes were part of a state-run doping program. A detailed report by the World Anti-Doping Agency on Monday said the doping program was in place for years before and during the Olympics. After a subpar showing at the 2010 Winter Olympics, the Russians devised an elaborate, clandestine plan to ensure a stellar performance at the 2014 games they were hosting in Sochi. Here's how it worked: In the dead of night, Russian officials exchanged the tainted urine from their athletes who had been doping with clean samples by passing them through a "mouse hole" drilled into the wall of the anti-doping lab. When the urine was tested the next day, there were no signs of doping, according to a detailed new report. The Russian results in Sochi were spectacular. The Russians won 33 medals, more than any other country, compared with a disappointing 15 medals in Vancouver four years earlier, a count that put them in sixth place, just behind Austria. The report released Monday was produced by Canadian professor Richard McLaren, on behalf of the World Anti-Doping Agency. The Russian actions have been so egregious, and the doping so pervasive, that the anti-doping agency recommended the unprecedented step of banning the entire Russian team from the Summer Olympics next month in Brazil. The International Olympic Committee, which has already barred the Russian track and field team, held an emergency meeting Tuesday to consider the recommendation. The IOC said it would "explore legal options" but put off a final decision, though the games start in less than three weeks. The Russians have repeatedly denied the existence of a state-run doping program. "Today, we see a dangerous return to this policy of letting politics interfere with sport," President Vladimir Putin said in a lengthy statement on Monday. The Russian operation in Sochi was first reported at length by The New York Times in May, and McLaren's findings provided additional details as it looked at Russian efforts that apparently began ramping up after the poor showing in 2010. The key source for both McLaren and The Times is Dr. Grigory Rodchenkov, the former head of Russia's anti-doping agency, who fled the country after he was implicated last November. Rodchenkov, who is now in Los Angeles, has estimated that 100 urine samples were swapped out during the Olympics, including those of at least 15 Russian medal winners. The new report said the widespread Russian doping efforts included a special operation set up specifically for the Sochi Games. Security was extremely tight at the anti-doping lab for the Olympics, but Russian officials were among those with access. In an adjacent room, Rodchenkov said, he had clean samples from the Russian athletes. The athletes had produced them months earlier, when they temporarily stopped taking a three-drug cocktail the doctor said he developed. Those clean samples were frozen. A small hole in the wall of the lab, near ground level, was covered during the day. But at night, it was opened so the urine samples could be exchanged with Evgeny Kurdyatsev, a Russian official who worked inside the lab, according to the latest report and the earlier one in the Times. "At a convenient moment, usually around midnight when no one else was in the room, Kurdyatsev would pass the protected athletes' A and B samples through the mouse hole in the [lab] to the operations room where Dr. Rodchenkov and others were waiting," the report said. "Once the samples were passed through, they were given to [Russian intelligence agent Evgeny] Blokhin, who had a security clearance to enter the laboratory under the guise of being a sewer engineer employed by engineering company Bilfinger." However, the exchange of urine was complicated because the dirty samples, produced by the athletes shortly after competition, were in marked bottles with seals that were supposed to be tamperproof. The Russians managed to open the bottles without detection, disposing of the dirty samples. They then replaced them with the old, defrosted, clean samples and resealed the bottles. Investigators checked a representative set of 11 bottles and found that all 11 "had scratches and marks on the inside of the bottle caps representative of the use of a tool used to open the cap," the report said.